Mustad G34131NP-BN Grip Pin Max 2X Strong Flipping hooks were developed and designed by Elite Series angler, Denny Brauer for fishing plastics in heavy cover. With Denny's history and time invested in picking apart heavy cover while flipping and pitching his plastics he knows what is needed to be considered a top quality flipping hook. The Grip Pin Max 2X Strong Flipping hook is a straight shank design with a wide bite and sleek integrated keeper to keep baits perfectly positioned and securely anchored. 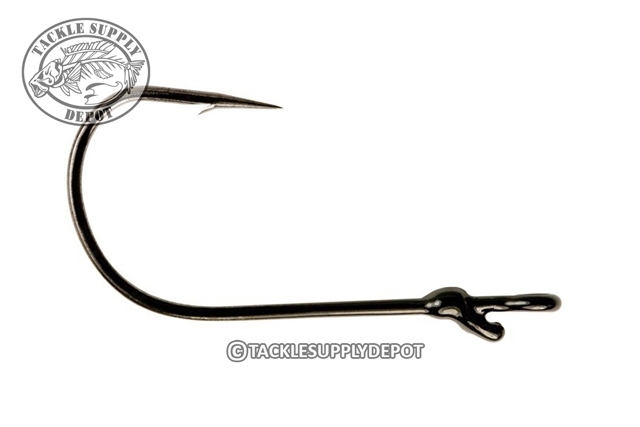 Additionally the hook is completely sealed for 100% confidence when fishing braid super lines. Chemically sharpened and Nor-Tempered to be up to 30% stronger than conventional hooks, Ultra Point is a very sharp, very strong needle-point that delivers quick, easy penetrations and longer performance. The grip pin just got better with this fluorocarbon flipping hook. Love the bend on these hooks to help keep fish pinned. Great flipping hook with fluorocarbon and is sticky sharp. The grip pin does a really great job at holding the bait up on the hook as well as being durable.